When I heard that Star Bar, an establishment in which I had drunk away many of my younger and more debaucherous years, had reopened as "The Market Hotel", the first thing I did was check the menu to see if they had a parma available. Low and behold, they had two! 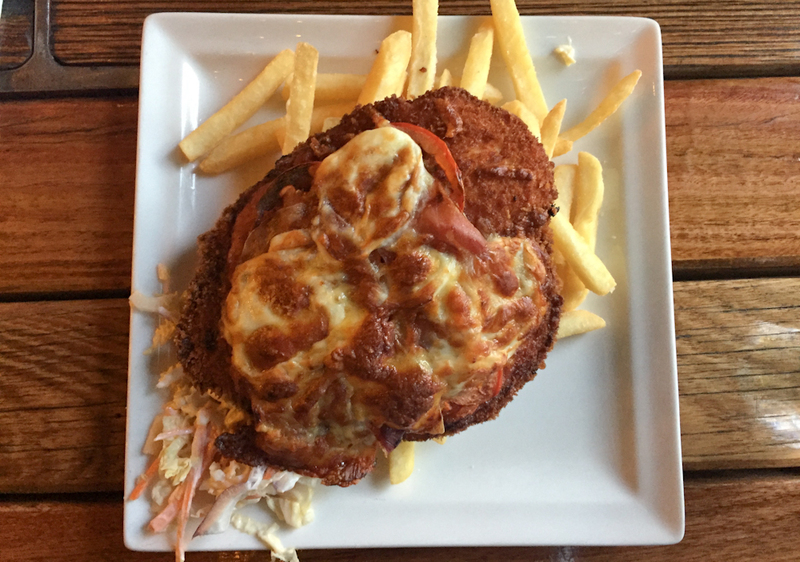 We wasted no time in loading up the parma bus and heading to Clarendon Street to see what Star Bar The Market Hotel has to offer. Holy cow. What a transformation. Virtually unrecognisable from its Star Bar days, the Market Hotel is an absolute triumph of pub design. Massive glass windows let in copious amounts of light, its open, airy and classy from head to toe. The vibe changes from room to room (and there are a lot of rooms to choose from), but every space seems thoroughly thought out and perfectly executed... I Could go on, but I try to keep these things under a thousand words, and even then I don't think I could describe it accurately enough. However the parma review below pans out, do yourself a favour and go check out the Market Hotel, if only for the ambiance. As much as I do love the occasional Mexi-parma, the "Classic Royale" sounded too good to pass up, and surprisingly the rest of the table agreed with me as we all ended up getting the standard (or "Classic") parma option. Plenty of options on tap in terms of beer selection. From Stone & Wood and Two Brothers all the way to copper tanks of unpasteurised Carlton Draught (visible in the above photo). Even got a glimpse of a cocktail or two that looked mighty fine. My first thought upon laying eyes on the Market parma was "Oh crap, they've burnt it" as the crumbs were insanely dark. Imagine my surprise, however, when cutting through it to find a surprisingly juicy, pure white chicken breast waiting underneath, and although a little overcooked for my liking, the well done crumbs added a much welcome crunch to the schnitzel. One of my pet peeves is lukewarm-cold chicken. The Market Hotel will not be receiving any complaints from me. I'm not sure how they did it but the Market's parma remained absolutely piping hot throughout the entire meal, with steam rising from the plate until the final bite. The toppings were a bit of a mixed bag. First up, I loved the crunchy prosciutto - I don't know where the trend started to leave prosciutto uncooked, but when I have prosciutto on a parma the crunchier the better. Absolute perfection. The buffalo mozzarella was nice, but, as with most mozarellas, was a little bland and didn't add a whole lot to the dishes flavour profile. The napoli was quite interesting as, as far as we could tell, the Market has gone for a combo of grilled tomato slices and a more traditional napoli. The tomato slices were a fantastic touch, however the napoli itself seemed to soak into the crumbs leaving them a little soggy on top, and an extra teaspoon or two wouldn't have gone astray. I wish the chips could have blown me away as much as the parma did, but unfortunately not. They were fine, don't get me wrong, but nothing to write home about, and Reviewer Stefo complained (as you'll see in his quote below) that he received a fraction of the chips on his plate than everyone else. For only $20 with such an array of quality ingredients I'm calling this a bargain, like the renovations I don't feel as if they cheaped out with any element of the parma (maybe the chips, a little), and I'd be more than happy to spend what I did again. While no Parma Night that I could see, the Market does offer 20% off all food on Monday night for locals. Definitely worth a crack. As I said at the start of the review the Market is worth a visit just to check out what they've done with the place (especially if, like me, Star Bar was a haunt you frequented once upon a time) - An added bonus that the parma is also worth trying. I'm a little sad that nobody opted for the Mexican parma as I'm genuinely curious to see what it's like, however on repeat visit the Classic Royale with its crunchy prosciutto would be hard to pass up.